The author believes the Society of Friends is a mutation that emerged from the Reformation movement of the 17th century. If there had been no Puritan movement there would have been no Society of Friends. Rufus Matthew Jones, (1863-1948) philosopher, mystical scholar, Quaker historian and social reformer, graduated from Haverford College in 1885 and received M.A. degrees from his alma mater in 1886 and from Harvard in 1901. He taught at Oakwood Seminary (1886-7), and Friends School, Providence, was principal of Oak Grove Seminary (1889), was recorded as a minister (1890), served as editor of the American Friend from 1893 to 1912, sat on the Board of Trustees of Bryn Mawr College from 1898 to 1936, and became an instructor in philosophy at Haverford College (1893), retiring in the T. Wistar Brown chair in philosophy in 1934. The author of over 50 monographs, Rufus Jones was especially known for his work concerning mysticism. His scholarship, writings and teaching helped to popularize mysticism in the era between the two World Wars. 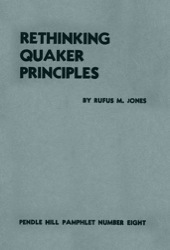 Rufus Jones had as a key life mission the healing of the 19th century split in American Quakerism. This work bore fruit in the 1950s with the reunification of American Quaker Meetings. He was instrumental in the establishment of the Haverford Emergency Unit (a pre-cursor to the American Friends Service Committee) that prepared members for relief and reconstruction work in Europe after World War I. A world traveler (it is said he traversed the ocean 200 times), Rufus Jones met with Mahatma Gandhi at his ashram in India, and spoke with religious leaders in China and Japan during a trip in 1926. In 1938 he traveled to South Africa, meeting with General Jan Smuts and returning via China and Japan. In that same year, he participated in a mission with George Walton and D. Robert Yarnall to Germany to see if a peaceful means of dealing with Nazis could be reached. He made this trip at age seventy-five. He lived another ten years, continuing to be active in writing, speaking and service to the Religious Society of Friends and the broader community.